The GSMA has published a proposed technical specification for a common standard for managing loyalty cards, coupons and vouchers in a mobile wallet — and is asking for feedback on its proposals from retailers, loyalty and coupon scheme operators. “The use case most widely associated with NFC is mobile payment,” the mobile network operators’ association says. “Yet many in the industry see the greatest benefits of NFC coming from the additional services it is able to support at a retail checkout where it allows for a fast, intuitive and accurate way to use cards and vouchers when completing transactions in-store. “A customer will realistically only carry one or two loyalty cards or vouchers in their wallet but with NFC they can carry all the cards and vouchers they need, ready to use them when the opportunity arises, and it is possible for retailers to push targeted coupons over the air using a whole raft of relationship management tools. “Feedback from retailers that a lack of a common standard for managing loyalty cards, coupons and vouchers in a mobile wallet is a barrier to the development of these services has led the GSMA to take the initiative in this field,” the association adds. 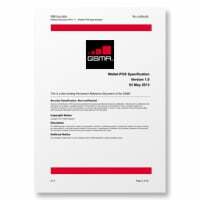 Readers can download GSMA NFC Mobile Wallet-POS Specification — Version 1.0 from the GSMA’s website. Feedback can be provided until 2 July 2013.